The development is close by to Bedok, Pasir Ris and Tampines housing estates. Dahlia Park is accessible via the nearby expressways - Pan Island Expressway (PIE), Tampines Expressway (TPE) and East Coast Parkway (ECP). It takes only 5 minutes or less to commute to the Changi Airport. 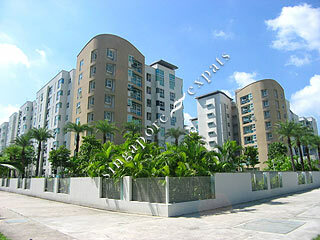 It itakes about 5 minutes drive or bus ride to the nearest Simei or Tampines MRT station. Nearby amenities include Loyang Point, White Sands, Tampines Mall, Century Square, The Japanese School Tanah Merah & Laguna Golf and Country Club. It is quiet and cozy. Full condo facilities. Nice layout and easy to put furniture. Window is open from bottom so can shield the rain from coming in the unit. Very quiet. Full condo faclities. Long swimming pool. Good design of window which prevent rain sipping through. Big window. Nice layout of flat. Though not near MRT, there is a choie of shutle bus and normal bus which stop is just at the condo. 10 mins to Tampines. Very quiet area but easily accessible to busy Tampines.